TweetDeck already offers a popular, cross-platform desktop Twitter app. How does its new, free iPhone app compare—both to their desktop client and the numerous iPhone Twitter apps already available? Column By Column: TweetDeck shows your Twitter friends’ updates in one column, but just flick over to see your replies and mentions as well as your direct messages in other columns. My answer: Pretty well, actually. TweetDeck’s distinctive columns-based interface translates well to the iPhone, and it’s certainly a smart way to use Twitter. Your friends’ updates live in one column, your replies/mentions in another, and your direct messages in a third. The columns are treated like Safari’s tabs—after tapping on the Columns button, you can flick left and right through them all. And you’re not limited to just those three columns. You can create new columns—for other accounts, Twitter searches, or user groups—with the supremely well-implemented Add Column interface. Groups in TweetDeck are implemented better than any other Twitter app I’ve tried. It’s entirely straightforward to select multiple users to corral into a single column. TweetDeck suffers slightly from offering too many options for navigating columns. With the Columns tab bar icon, the arrow on the upper-left with identical functionality, plus the pair of arrows on the bottom for switching between tabs one at a time, the limited space on the iPhone’s screen is needlessly cramped with redundant functionality. The app hides its Settings tab unless you’re in Columns view, and the bottom arrows overlap too much actual tweet content. Cutting back on one or more of these column-switching interfaces would resolve both of those issues without limiting functionality, especially since you can also simply flick left or right on an individual column to swap to the next one. Column Customization: Not happy with TweetDeck’s columns? Use the app’s customization features to create columns for other accounts, searches, or user groups. The app uses Growl-esque notifications to alert you when new tweets appear in any of your columns. The alert’s not customizable, and it’s a bit heavier than I need, since there’s a separate “new tweet” indicator on the bottom left corner of the tab bar. Fortunately, there’s an option to turn it off, and I have. 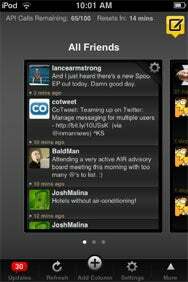 Like most other iPhone Twitter apps, TweetDeck integrates with the iPhone’s camera and services like yFrog and TwitPic. It’s also painless to grab a URL from another tweet to write about yourself. Composing tweets works fine, with a portrait-mode-only keyboard and the ability to shrink your links before you post. As in Tweetie, double-tapping a tweet brings up a screen with options to reply, retweet, e-mail, or designate as favorite. Setting TweetDeck in a class by itself is its tight integration with its desktop counterpart. You can sync columns and unread tweets by creating a free TweetDeck account. No other iPhone Twitter client with a companion desktop app offers this feature—but they all should. Not needing to scroll through a long list of tweets to find where you left off is exceptionally useful. Besides an overly-cramped interface (which, again, seems easily fixable), TweetDeck only ever suffered one other major negative: Early versions of the app were crash-prone. A recent update addressed the bulk of these stability issues, and I’ve now been using the app crash-free for several days. With a bit of layout cleanup, I suspect TweetDeck will rival Tweetie and Twitterrific as the dominant Twitter app for iPhone. 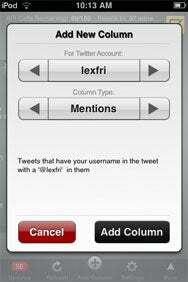 TweetDeck is compatible with any iPhone or iPod touch running the iPhone 2.x software update.